The Pura Vida Cave House, Outdoor Jacuzzi (4-6 pax). Located in Imerovigli, 7 minutes walking distance from the hotel. Renovated in 2015. Includes two bedrooms with Queen size beds, a living room with 2 built in sofas (that become single beds), a kitchen & two bathrooms. The private veranda has an outdoor private built Jacuzzi, sunbeds and Caldera view. Ideal for two couples & company who will enjoy the space. 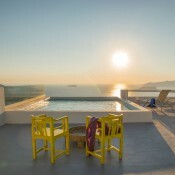 Located in Imerovigli, 7 minutes walking distance from the hotel. Renovated in 2015. Includes a bedroom with a steal double bed, a living room with 2 traditional couches (that become double beds), a kitchen & bathroom. The private veranda has an outdoor private built Jacuzzi, built in sunbeds and Caldera view. Ideal for Honeymooners.